During the early 60s, two friends, one from Barcelona (Arnau) and one from Madrid (Campos) bought a plastics manufacturing company that was bordering on bankruptcy: Madel (Manufacturas Delgado=Delgado Manufacturing). Arnau is the son of the founder of Exin Bros, one of the largest toy makers company in Spain. The same company that made Scalextric slot cars , Exin castillos, Cine Exin and others. The first madelman figures were released during Xmas 68, in a small display box that was later changed to the standard box in 1971. The early madelman figures didn't have feet but rather pegs onto which the boots were fitted. Also, they had what collectors call �crystal eyes�, which were handpainted! About 75/76, they developed the second madelman figure, which had jointed feet and painted eyes. A female figure was also added to the line. A third body type was released during the last years of Madelman in 82/84. Instead of being a new body, it was just a combination of previously released figures: torso, arms and chest from the male body and the legs of the female body. Madelman figures were eventually manufactured in Mexico, by Exinmex. The molds made by Exinmex were the same as those made in Spain, but there were remarkable differences in the quality of both the costumes and accessories. Exinmex also released some figures that were different from the Madel Spain line. The only problem with the figures were that they were too fragile, their hard fingers and knee and elbow joints were easily broken. Still, I don�t think that there are any other action figures from the 60s or 70s figures that are so poseable. Madel stopped making madelman figures in 1984. They eventually closed down all of their toy lines the same year. One of the reasons Madelman has become so collectible not only in Spain, but in another countries from Europe and even the USA, is the quality of its accessories. You see, Madelman rarely painted their accessories. If something was made in two different colors, such as rifle, they would construct it with 2 seperate pieces, a wooden-like piece and an iron-like piece. Awesome considering the scale! The variety of figures was quite impressive including Astronauts, Pirates, Cowboys, Military Figures, Super Heroes and even Eskimos! There are several madelman customizers in the market. 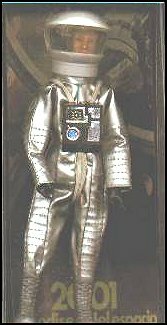 One of the most remarkable custom madelman figures was the one promoted by J. Gasull, a 100 units replica of the first Madelman 2001 astronaut in the blue box. As I write this, Gasull has another exciting project in the works: A madelman fighter pilot in a display box. Pretty exciting as this figure (ref 120) was never released!. There are only pics of the prototype but for some unknown reason, Madel never released this figure. Today, an increasing number of collectors have discovered the quality and variety that the unique madelman line offers.